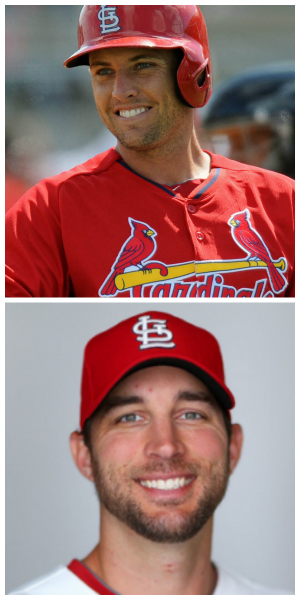 Whose Game Was More Gorgeous, Bourjos Or Wainwright? It was a beautiful 7-1 win for the St. Louis Cardinals over the Atlanta Braves last night. Wait — it actually was a gorgeous win, with Peter Bourjos having the best game of his Cardinals career so far and Adam Wainwright having a pretty stellar night too, both on the mound and at the plate. It was the kind of game that made us remember those times when these things used to be routine … everything coming together on both offense and pitching in the same game. But, as we all learned long ago, you’ve got to play them one game at a time. And this one game was definitely a step forward for the now 18-17 Cardinals, with 13 hits to go with those seven runs on offense and the pitching continuing to be such a strength. But which of our two heroes had the better night? You’ll actually find both of them at the top of the stats list of the Cards hottest hitters in the past seven days, as Wainwright has hit .600, which includes a double and a single last night plus two runs scored. Overall, he’s hitting .400 for the season — thus well on his way to being The King Of All Pitchers with his stated intention to win both the Silver Slugger and Cy Young Award. He also became the first National League pitcher to six wins this season, joining Mark Buehrle of the Blue Jays who won his sixth yesterday too. Wainwright allowed the one run on six hits while striking out six and walking win. Obviously, a nice bounceback from his previous start last week at Wrigley Field. Then there’s Peter Bourjos. After his rare-as-of-late start on Monday night in which he went two for four and was rewarded with the chance to sit on the bench Tuesday until entering the game as a defensive replacement in the eighth, he definitely made his presence back in the lineup Wednesday known — from the very first pitch thrown to him by Mike Minor. Yes, Pete launched a homer to center — his first as a Cardinal and his first since June 20 last year. But he wasn’t done with the offense. In the fourth, he singled and scored on a Matt Carpenter single (after advancing from first to third on Wainwright’s single — and it is fun to watch Bourjos run). The next inning, Pete was up with Jhonny Peralta at third base and singled to score Peralta … and drive Minor from the game. His final at-bat was a ground-out, which in itself was actually nice to see since it wasn’t a strikeout. Over the past week, Bourjos is five for 10 with three RBI. Just behind Wainwright and Bourjos on that “last seven” stats list: Matt Carpenter, who last night was three for four with the RBI to score Bourjos and two runs scored. He’s hitting .409 in the past week — a welcome sight too. Matt Holliday also had three hits and three RBI, while Matt Adams had a double. Ironically, now that the rest of the offense seems to be turning around, the man who carried the team when it wasn’t — Yadier Molina — is not hitting. He was 0 for four last night and just one for 13 in the Braves series. And now, with the momentum of the offensive spark from last night, the Cardinals have a day off today and open a series in Pittsburgh tomorrow night. It should be interesting — the Pirates are currently 14-20 and in fourth place in the NL Central but just took two straight over the NL West-leading Giants (including the first-ever walk-off-win-via-replay review in MLB history). Michael Wacha gets the start for the Cards against Francisco Liriano. Plus, if you don’t yet subscribe to The Bird’s Eye View series preview e-newsletter produced by the United Cardinal Bloggers, you can easily subscribe here and get the Pirates series preview tomorrow — written by yours truly. Oh, and to answer the question in the title? Peter Bourjos, of course. He isn’t called Gorgeous Bourjos for nothing. This entry was posted in 2014 Cardinals and tagged Adam Wainwright, Atlanta Braves, Gorgeous Bourjos, Matt Adams, Matt Carpenter, Matt Holliday, Peter Bourjos, Yadier Molina by Christine Coleman. Bookmark the permalink.